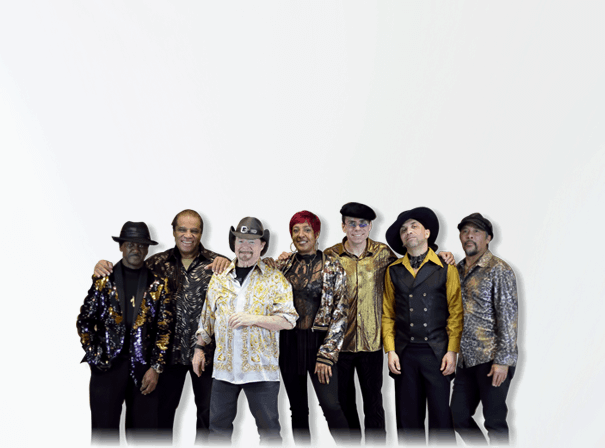 The Family Stone are best known as former members of pioneering psychedelic soul group Sly & The Family Stone. Though they now perform with a reduced line-up, the relentless grooves and funked-up energy of their live performances remain stronger than ever, delighting stadium-sized audiences across the globe with renditions of their best-loved hits. Sly & The Family Stone made history as the first major American rock group to have a racially integrated lineup with members of both genders. Their highly influential releases synthesised a variety of genres to form something indefinable, but undeniably funky: their extensive list of Top 10 Billboard hits includes ‘Dance To The Music’, ‘Everyday People’ and ‘Thank You’. Rolling Stone has ranked the group 43rd in their list of music’s 100 Greatest Artists, including three of their records on their catalogue of the 500 Greatest Albums of All Time. The band were inducted into the Rock and Roll Hall of Fame in 1993, and their albums remain perennially popular with music fans of all ages and nationalities. The Family Stone now consists of original member Jerry Martini and Sly’s daughter Phunne Stone, performing alongside exceptionally talented musicians Swang Stewart, Blaise Sison, Nate Wingfield, Frank Klepacki and Jimmy McKinney.